Man, I have the lament post titles. To celebrate Halloween/fall season I made River a quick little top the other day. I thought I had a white t-shirt in my stash, but only had a onesie in his size so that's what he got. I like it just fine. To do this I did as follows (feel free to leave now and google freezer paper stencil for significantly more detailed, more qualified instructions). Walmart sells little acrylic paint squeeze bottles for $.97 in the craft department. I picked up peach and green. At home I googled "pumpkin images" and found one I liked, printing it out to the size I wanted. Usually I just use the trial and error method to get the image magnified or decreased to what I want but I lucked out this time and it was just right when it came out of the printer. I then placed freezer paper over my image picture and traced the image, keeping the plain, smoother, side of the freezer paper on the top. I traced the pumpkin and the stem separately, creating two different stencils. I then cut out the pumpkin. What you want to do is to remove the parts that will be colored. When I removed the stem area I used an exacto knife so I'd get it just right, anything with any detail is best done with an exacto knife. The center of the stem "swirl" is not colored in, so I had to cut out that little bit as well so I could add it back in later. 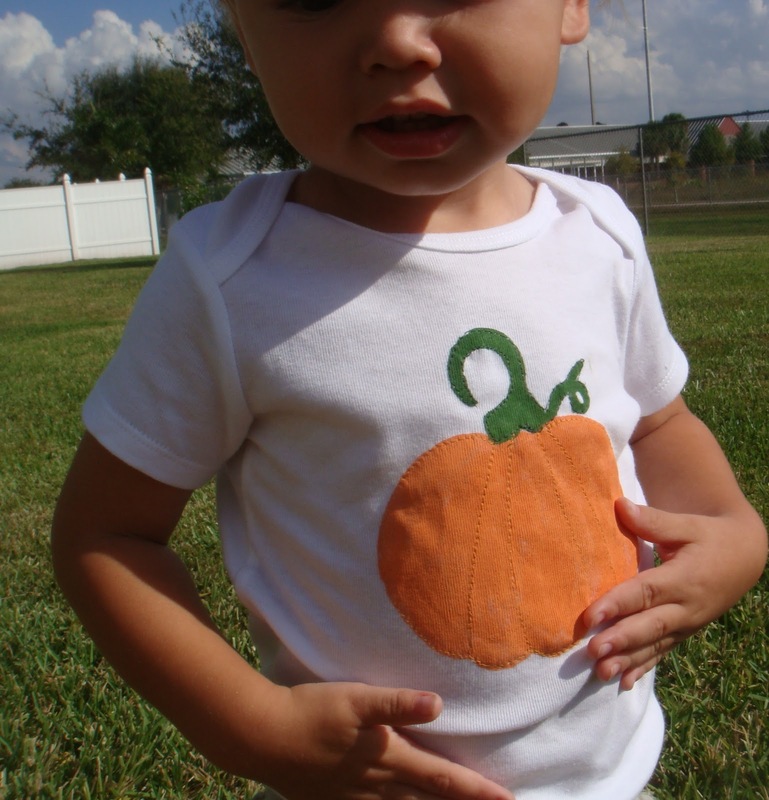 I then pressed the unremoved part of the pumpkin onto the onesie, using a warm iron, pressing the side of the freezer paper with "stuff" on it onto the onesie. After a few seconds of pressing it'll stick. Once it was on the shirt I painted the shirt, being sure to first put a barrier between the front and back of the shirt (I used a piece of cardboard ... use something or your paint will bleed right through to the back and look bad (very bad)). Normally I just paint it very solid using a brush or a sponge, but this time I wanted the pumpkin to have sections so I painted in kind of crescent motions, to mimic the sections (yeah, that makes a whole lot of sense). As it was drying I removed the freezer paper. If you're making a few of the same thing you can reuse the freezer paper a few times, it'll still have some stick left in it. Repeated the above with the stem section, except after pressing down the outside of the stem I added my tiny little piece that makes the stem look like a curly stem instead of just a big blobby "o" with wings. I then went and stitched in the lines I wanted and outlined both the pumpkin and the stem. Before doing the sewing I should have interfaced the area but I was in a hurry and didn't ... next time I would. Last step - toss adorable kid into the onesie, send biggest sister out to take some pictures of him (she took this heart melting one of her and him herself), and go visit Mima and Boppa (Grandma and Grandpa). Cute, cute, cute! I miss those onesie days, as they're long gone at my house, but my sister is having a run on grandbabies, so maybe I can freezer paper stencil some for my great nephews.